November: a time to reflect on the many things that we are thankful for. There’s family, friends, faith, health, warm homes, food on the table, and many more! We here at Block Party Studios are especially thankful for all of you. Whether you stop in our shop, see us at a Quilt Show, order from our web-site, or purchase our products from your favorite quilt shop, we are very thankful for all of you! Without you, we wouldn’t be here! We had a very successful Fall Market and Fall Festival in Houston at the end of October! The van is a lot lighter than it was on the way down – Thank You! If you’ve never been to Festival in Houston, put that on your Bucket List of things to do. It is always the last weekend of October, and is an amazing experience! As I said in last month’s newsletter, we have several new panels for you to enjoy! The 2 that you have not seen are for the funnier side of quilting. “Inside A Quilter’s Mind” is a take off on our “Things Quilters Really Think” Panel. There are 12 – 3 ½” funny squares and 2 – 7” x 10 ½” rectangles. We have put our “Born to Quilt” tattoo on one of the rectangles and our “To Quilt is Human, To Finish is Divine” on the other. The print is 2 colors – Black and Red on Natural or White. We’re still trying to come up with a pattern for this. What will you do with it? 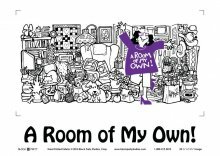 Our second funny panel is “A Room Of My Own”. You know that “Man Cave” panel we have, well now it’s a room for us! The quilter on the panel is completely thrilled with the chaos she has created in own little room! The panel is printed in 2 colors – Black and Purple on White only. We have used our “Therapy In Session” pattern to make this wall hanging one that is perfect for your own sewing room! Have fun, and remember: “I’m Creative, Neatness Doesn’t Count” – that’s my motto! 1-800-419-2812 to register and to receive your supply list. Cost is $30.00 including the cost of the pattern. presents for all of those quilters on your list! We will be closed Thursday, Nov. 27 through Saturday, Nov.
families. We will reopen on Monday, Dec. 1st! Happy Thanksgiving from all of us at Block Party Studios!